Would you like to visit a place where you have the chance to observe otters, squirrels, alligators, deer, raccoons, woodpeckers, blue herons, hummingbirds, cormorants, fish, and many other species of Florida wildlife in their natural habitats? And, you can do this from the comfort and safety of an observation deck or dock over the river. If you prefer, you can just sit on the screened porch overlooking the beautiful St. Marks River and soak up the peaceful solitude of a completely unspoiled environment. As the sun goes down, you will be captivated by the rhythmic melodies of the frogs and crickets, guaranteed to soothe your soul. Payment may be made using Pay Pal via several major credit cards. Owner will send a Pay Pal invoice when reservations are agreed upon. We loved our stay at this cozy cabin. The inside was super clean and comfortable, but our favorite spot was the ample screened-in porch, where we ate meals, drank wine, read and took naps! Our second favorite spot was down the wooden deck to the river, where we sat and watched the grasses sway in the current (and sometimes stood to spy minnows, bigger fish and turtles.) We would have been quite content to stay at the Retreat -- and we hear some folks never leave -- but we didn't haul our kayak and SUP there for nothing. One day, we paddled upstream; it required a little effort but not for long, as the river widens and the current slows. Where it widens, it's like a bird sanctuary: ibises, cormorants, anhingas, ducks and more. On our way back, my husband saw that he was about to hit a log -- only it wasn't a log, it was a manatee! Great fun heading downstream back to the cabin with that big guy. On another morning, we paddled downstream to the Newport boat ramp (at U.S. Highway 98), which took a very leisurely three hours. It could have been quicker, but we spotted yet another manatee and paddled with that guy for about an hour. Also saw a gator sunning himself on a log. Floyd and Carolyn are very warm and friendly, and give you lots of helpful (and humorous) information in writing to enhance your stay. Don't miss the beautiful picture books for your perusal! This is a cozy cabin for two, but comfortable enough for four. Looks rustic on the outside, but the inside is a lovely and clean home setting with comfortable furniture, including the beds.. Kitchen is efficient. The best part of the house is the large screened in porch. It has comfortable furniture with a great porch swing and large and effective ceiling fans that keep the porch comfortable even on a hot summer day. You can see the beautiful St. Marks river from the dock, which is shaded much of the day, or you can sit inside the porch and enjoy the same view, free from insects. We were there for three nights. We were serenaded by frogs and cicadas, and saw deer, raccoons, ibis, great blue heron, great white egrets, one small rat snake (perfectly harmless and effective for keeping other pests away. The humming birds hummed and chirped and chased each other at the feeder every time we went out on the porch, which was often. The small town of Woodville is just a few miles away and has a grocery store, gas stations, etc. Be on the lookout for other wildlife when you drive through the area. Deer are plentiful. The Aucilla and Wakulla rivers are also close by and you can rent canoes and kayaks for a scenic river trip. You can reach the owners very easily if you have any problems but the property is so well maintained you probably won't run into difficulties. We enjoyed our stay very much and plan to return. Want a secluded place with wildlife right near by? On the St. Marks river, this get away is perfect for birders seeking to see St. Mark's Nature Preserve that is a direct flyover for over 100 migrating species. The preserve beaches nearby are pristine Gulf beaches that go for miles to an 1860 Lighthouse. You can see so many racoons, otters, and others just from the river dock in back of the cabin. 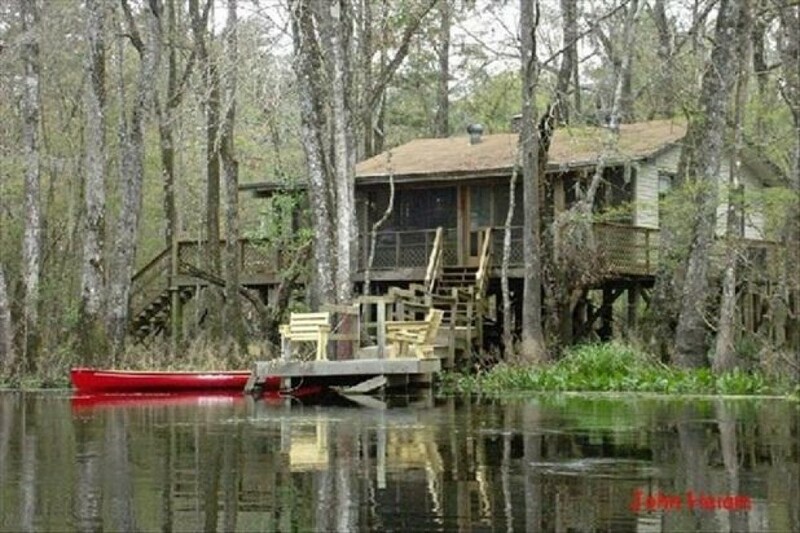 The decks with a comfortable porch on the river that is screened in and an open porch on the side with a gas grill. The perfect combination of historical, but fully restored WWII housing make this two bedroom, kitchen, front room, and one bath like stepping back into a by-gone era. There are books and much more to acquaint you with birds and wildlife that are right around you. Be careful at night and drive very slow for the deer that are numerous in the area. This is a one of a kind place for nature and history lovers - it is not a party place. It would also be great for Florida State parents looking for a quiet place to give their college kids a good home cooked meal. Be sure to see the Battle of Natural Bridge. This battle fought by those elder and young (the able body men had gone off to fight for the Confederacy) kept the Union from taking Tallahassee (the only state capital not taken by the Union during the Civil War). Their sacrifice is cherished and remembered in a nice park with a picnic area. So much to see and lots of nice extras to enjoy them with at the cabin. A home away from home. Floyd and Carolyn set the bar and standard of Southern hospitality and comfort. If you leave this Retreat un-refreashed and un-rejuvenated. It's your fault.